Applying automation to healthcare and medical claims management solutions can go a long way in reducing overall costs and increasing efficiency across the board. Ranging from hospitals to independent clinics, all healthcare service agencies state cost efficiency and service excellence among their priorities. Automation of billing and medical claims management can be critical to achieving these priorities. The crux of automation can be defined as the deployment of IT systems that control functionalities and reduce human involvement in the organization of data and monitoring of services. The use of automated IT systems has been maximized in other industries for many years now. However, the healthcare industry is now turning to these solutions for increased efficiency. Within the industry, the medical claims department stands to greatly benefit from medical claims processing solutions. Automation has always carried with it a negative and false notion of being directly responsible for the reduction in jobs. For example, when automation was introduced into the automobile industry, people assumed it would reduce the work force of automobile workers. However, what actually occurred was the reduction of redundant jobs by the automobile industry workers, and increased focus on intelligent and satisfying arenas of work. The same holds true for the healthcare industry. Manual data entries that are generally mundane tasks are taken care of by the automated processes and medical staff can focus on intelligent analytics and supervisory processes. The traditional approach to claims management has always been to hire more people to intensify the efficiency of the process. This method has not proved to be successful due to the added cost involved. 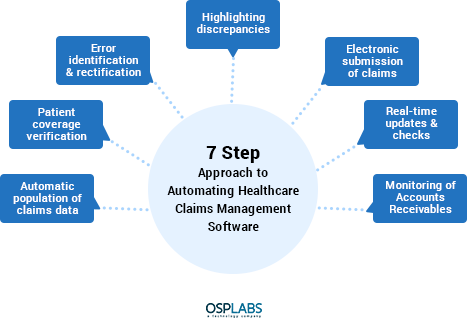 In recent times, more and more attention is being paid to automated claims processing software that come with the capability of increased efficiency, faster turnouts, thereby reducing overall costs. Technology is being used to execute processes faster and more efficiently. Electronic claims processing is slowly but surely turning into a necessity within the healthcare industry. Continual monitoring and evaluations are not a feasible or even practical expectation from human involvement, but can be continually executed through automated systems. Scalable medical billing software, along with claims management solutions are doing wonders to increase efficiency within the healthcare industry. 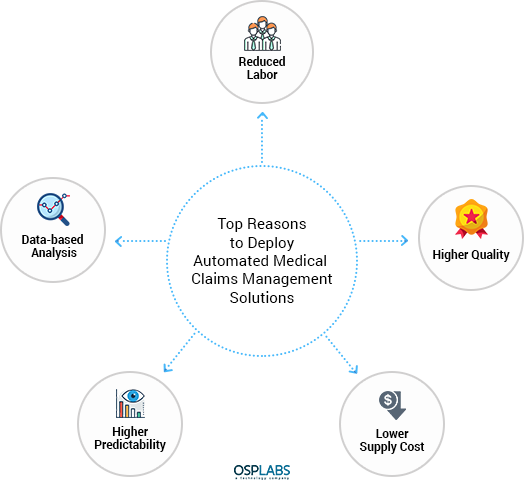 Reduced Labor: Automated healthcare claims management helps in the reduction of manual tasks that are executed faster and more efficiently by technology solutions. This means that the employees in the organization can focus on tasks that are higher functioning roles and the ones that require more clinical experience. Higher Quality: Electronic claims processing uses automated systems that are free of errors, commonly made by human entries. This is because the technology usage is consistent in its data entry features and in its analysis of the very same data. Lower Supply Cost: Claims processing in healthcare, when manually undertaken, involves a large amount of paperwork. When the medical claims process is automated, through claims processing software, there is a direct reduction in paper and other materials. Higher Predictability: Through claims management solutions, there is an accurate prediction of claims that are likely to be rejected or returned for more information. This avoids unnecessary back and forth and works towards cost and time efficiency. With predictable outcomes comes early intervention for seamless processing. Data-based Analysis: The claims adjudication process, when automated, uses the data to churn out meaningful analysis that can be used to increase performance and optimize processes. These programs provide information on means through which functionality can be improved. In the current reimbursement system, either a single analyst or a group of analysts have to consolidate through a heap of lists and reports and make meaningful connections for filing. The lengthy processes cause crucial information to be lost, wastes employee time that can be put to better use, delays patient care, causes extreme confusion on the right protocols and prevents consumer satisfaction. Incorrect information puts a further burden on medical claims clearing house. To be able to streamline the medical claims process, many factors need to be considered. The large amount of paper work that comes in bits and pieces, which is required to be consolidated and tediously filed. There is a high chance of human error, which results in further delays and claims rejections. Furthermore, gaining access to complete patient data is a hurdle faced by most healthcare providers. The outsourcing culture causes further complications. Additionally, the quality of data available is not error free, neither is it efficiently accumulated. This feature is a must-have and eliminates the requirement for manual intervention of data reentries. The system is geared to automatically generate the data based on initial entries. Thus, the data is organically created and generated and programmed efficiently. This is an excellent way to cut down on delays wherein the eligibility of the patient’s coverage can be confirmed electronically and payment recovery processes can be immediately started. This eliminates the frustrating time lag owed to inactive coverage causing denials. The automated software should be able to identify errors during claim submission and offer suggestions for rectifications. These errors can then be eliminated before submission with the aid of automated suggestions. Opt for a solution that is capable of highlighting claims that are likely to be rejected or refused. This will enable faster problem-solving and the efficiency thereby increased. Based on past inputs, the software can predict claims that are potentially those which could be denied. Prioritization becomes much easier through this feature, with attention demanded towards areas of immediate attention, such as pending matters. Some automation solutions come with the capability to create, verify and submit claims electronically. This erases the need for manual paperwork. Accessibility is increased through electronic documentation and records. High performance automation claims management software provide the capability of real time access to current and past claims, along with areas that need to be checked. It also reduces the need for manual processing. Finally, professional claims can be adjudicated in real-time through interactive transactional experiences. Quality execution allow the software to provide access to accounts and pending matters, thereby reducing costs related to policy and medical claims. Additional features include tracking of recoverables and fraud detection. 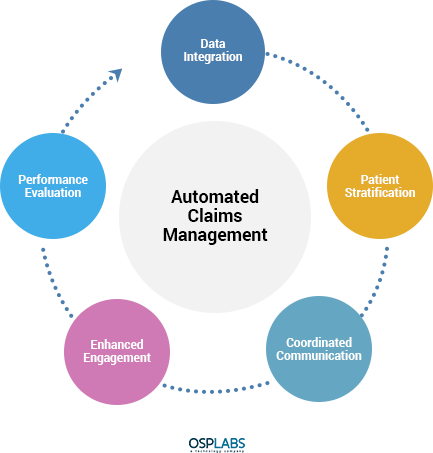 Even though automated claims management solutions have been prevalent for a number of years now, they have constantly evolved to provide higher satisfaction to all the entities involved in the healthcare industry. 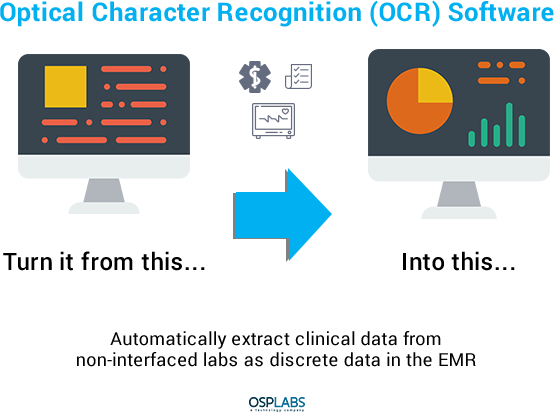 One such feature is the Optical Character Recognition (OCR), which has high potential in diminishing the possibility of serious errors in coding and claims filing. This is done through efficient scanning of documents and electronic programming and isolation. Whether it is a general fatigue of the manual processes involved in medical claims processing, the higher costs associated with it, or the inefficiencies and delays that are being experienced, the solution is close at hand. Automating healthcare medical claims management solutions can streamline the process through the entire lifecycle of claims submission. Whether it is the convenience of electronic data entry, or validation through the use of technology, or even the flexibility of errors being flagged prior to submission – the benefits are endless. Gone are the days where medical claims analysts need to perform tedious and mundane tasks, while being buried in a pool of paper work. Additionally, the endless phone calls and emails and complicated back and forth process are replaced with real-time checks of claim status and instant responses to queries. These automated solutions are poised to create satisfaction among all entities in the healthcare industry, through a diminished financial burden. Make a careful choice from the many options that are available since there could be some that offer limited features for the same price points as those that come with the entire spectrum of beneficial features. Finally, ensure that your software selection is one that is easy to use, rich in features, and user friendly in its approach and has cross device functionality. The software should be well integrated into the EHR system of the healthcare agency or practice. There are also several software options, available in the market, which can be customized to particular requirements.